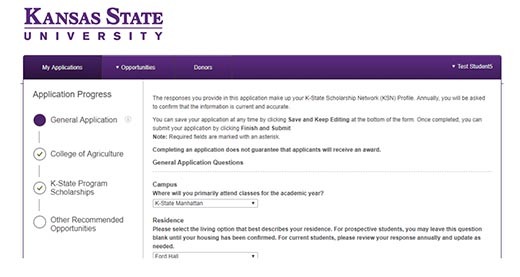 The K-State Scholarship Network (KSN) is an online portal that can connect you to additional scholarship opportunities. Through the system, you will be able to express your financial need, academic interests and involvement. Please read the instructions below for assistance with accessing and updating your KSN profile. 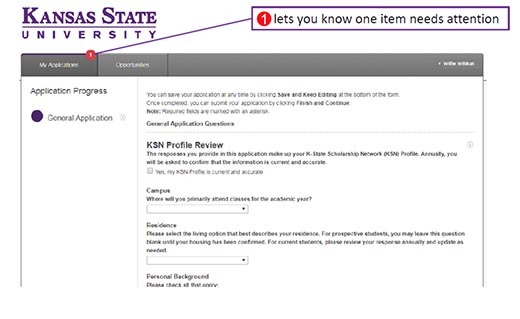 If you have any questions while creating or maintaining your KSN profile, please feel free to contact the Office of Student Financial Assistance at 785-532-6420 or email finaid@k-state.edu, referencing "KSN" in the subject line of your email. 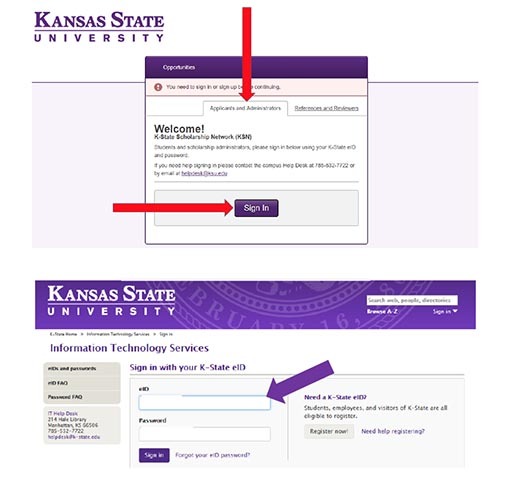 Sign in to KSN using your K-State eID and password. If it's your first time signing in, you will be taken to the "Opportunities" page, so you will need to click "My Applications" in the upper left part of the screen. Once here, please choose the General Application on the lower left. You may notice the word "Submitted" above the General Application section. 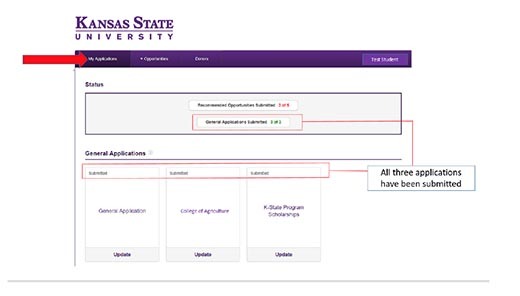 This simply means that the KSN system has synced your information from KSIS, K-State's student information system. 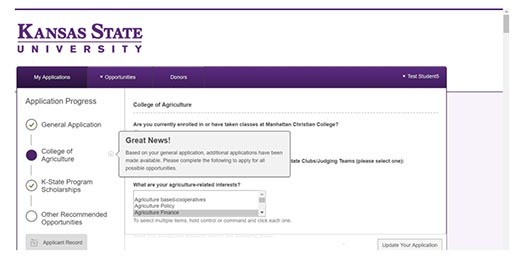 You will still want to click on "General Application" and answer all questions that apply to you. Complete the General Application with all requested information. Applications can be submitted or saved for completion later. Anytime you see a red circle notification appear over the "My Applications" tab, it means your attention is needed. Conditional applications will appear to qualified applicants upon saving or submitting the General Application. This will also be shown as an item in the application progress bar. Conditional applications are triggered by your academic college or major on record. As these applications are based on information needed for scholarships offered through these individual colleges, departments and programs, this section may not appear for all students — many departments will not have additional questions to be answered. You only need to complete the sections that are currently applicable to your academic major or situation. 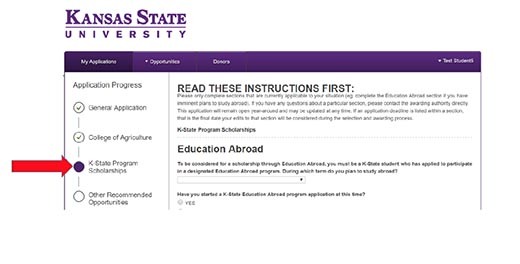 The K-State Program Scholarship application may next appear as a result of answers to certain questions on the General Application. This will also be shown as an item in the application progress bar. By completing the General Application along with any Conditional Applications, you will automatically be matched to numerous scholarship opportunities. Additionally, your answers may trigger the KSN system to recommend additional opportunities that require more action on your part. Under "Other Recommended Opportunities," you might see scholarship opportunities recommended to you after you have completed the General Application. These scholarships need additional action on your part to receive consideration. Select each scholarship to complete additional requirements. Please note that "Other Recommended Opportunities" does not mean you are being solely considered for the scholarships displayed. You will be automatically matched into other scholarships. The selection and awarding process will be done by the college or department your major is housed within, and if you were to be selected for a scholarship, you would then be notified by your college or department. Additionally, the awards that appear under "Other Recommended Opportunities" are not guaranteed. However, this section provides you with the visibility needed to find additional scholarships for which you may be eligible. Under "Actions", if "Apply" is visible, then you must complete additional questions to be considered. You can then click "Apply" for any opportunities that you have not yet applied for. The "Deadline" column on the "Apply-to" opportunities indicates the deadline to complete the material in order to receive consideration. Click on "Applicant Record" at the bottom of the General Application screen and review all information in your profile. Please check this data for accuracy. 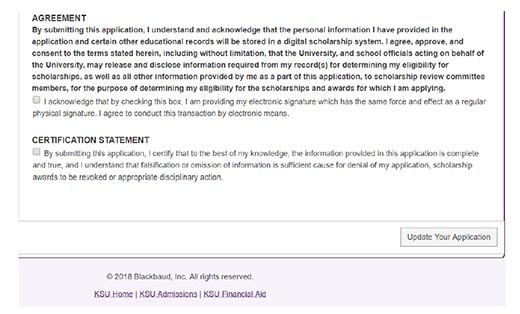 If there is missing information or changes that you wish to make to your record, please contact the Office of Student Financial Assistance at 785-532-6420 or email finaid@k-state.edu. 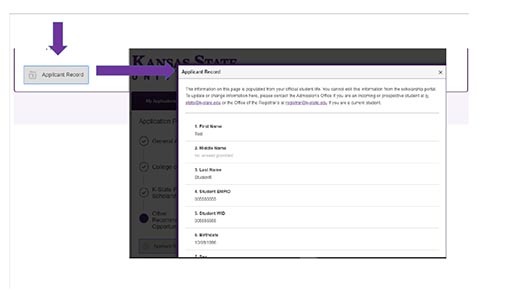 Once you have completed and submitted all applications that are available, the "My Applications" tab will summarize your submitted applications for you. Please remember that completing an application does not guarantee an award, but it does guarantee you a spot in the award's applicant pool. 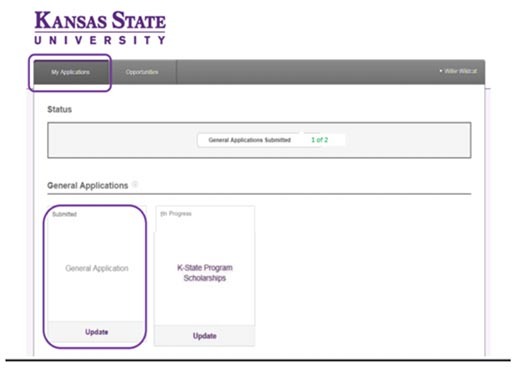 General Application: If this is your first time logging into the system for a scholarship cycle, you will be redirected to complete the general application. Save and submit your general application, you will be automatically matched to potential scholarship opportunities. Opportunities: This is simply another term for scholarships. Conditional Application: A Conditional Application will appear to qualified applicants, based on their college and/or major, upon the saving or submission of the General Application. Recommended Opportunities: After completing the General Application (and if applicable any Conditional Applications the applicant may be presented), applicants will be directed to the Recommended Opportunities page where the applicant will see any Apply-To opportunities for which the system determines that they may be qualified for. Applicant Record: This is compiled of information imported from official university files. The record itself is not editable by the student, but it is recommended students review their individual "Applicant Records" to make sure all imported data is correct and up-to-date. Contact the Office of Student Financial Assistance at 785-532-6420 in order to update or make changes to your "Applicant Record". Do I have to complete an application? You are not required to complete any applications to be considered for some scholarships. However, completing your general application and any requested supplemental documentation will increase your consideration for awards. What happens after I complete the application? After completing the General Application (and any Conditional Applications that you may be presented), you will be directed to the Recommended Opportunities where you will see any Apply-To opportunities for which the system determines that you may qualify. You will be notified by your college or department whether you received an award. How do I know when I am done in the system? Once you complete the General Application and any recommended applications, you will see that each of the applications on your dashboard shows a status of "Submitted". You can log out of the system knowing your information will be reviewed and forwarded to the proper review committee and department. You can check back in the system regularly to see if any new scholarships were added or make any changes to your application up until the deadline date if applicable. Do I have to apply every year? It's recommended that you update your scholarship application yearly or if any changes occur academically. We suggest updating your scholarship application frequently as new scholarships become available.